On 13 February 1904 Scotia returned to Laurie Island. This was later than expected and would reduce time in the south. 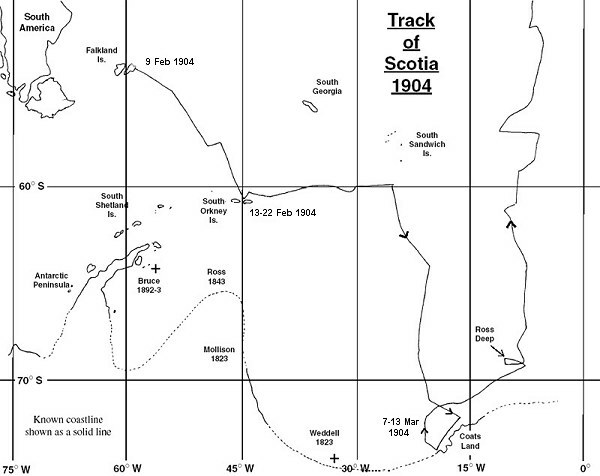 On 22 February Scotia sailed south leaving behind Mossman, Smith and the three Argentinians. Scientific exploration and discovery continued as Scotia sailed east then south. The ice pack was encountered at the Antarctic Circle. At 68°40'S, pack ice barred the way, but in gale-force winds Scotia ploughed through the pack to 71°S. Soundings were seldom less than 2,500 fathoms. On 1 March Scotia had a clear run south until stopped by the pack ice again at 72°18'S 18°59'W - the sounding was now 1,131 fathoms. Could the shelving of the sea bed indicate land? On 3 March, land was sighted 72°24'S 17°30'W, just 18km (11 miles) away. Scotia couldn't get any closer due to the ice barrier which rose between 30 and 45 metres (100-150 feet). The ship steamed along the ice barrier parallel to the coast. The depth was now 159 fathoms. The ice barrier contained many rocks including granite, schist, gneiss, quartzite, sandstone, shale and limestone - a good indication of the make-up of the Antarctic continent. High mountain ranges could be seen, but no naked rock was exposed. 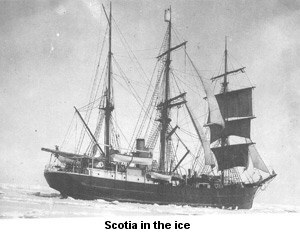 Scotia anchored for the night at the edge of the ice barrier (similar to the ice barrier in the Ross Sea). Next morning a gale blew up and there was danger of being trapped by ice in the shallower water. The new engineer had not kept a good head of steam for the engine and the ship became trapped in the ice only a few hundred metres from open water.